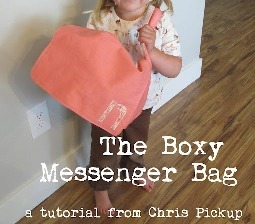 Chris from Pickup Some Creativity shares a tutorial on her blog showing how to make her Boxy Messenger Bag. She made it roomy enough to hold her daughter’s dolls, softies, and other toys. I’m thinking this would also make a great school bag! Get the how-to.